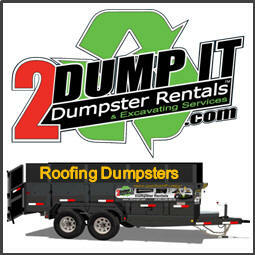 2 DUMP IT™ Dumpster Rentals is located in St. Louis, Missouri, we are the largest local dumpster company who specializes in 10, 15 and 20 yard rubber tired dumpster rentals. Our rubber tired dumpsters (dumpster on wheels) will not damage your drive or sidewalk, do not require permits, are approved by most HOAs, and best of all they are affordable. 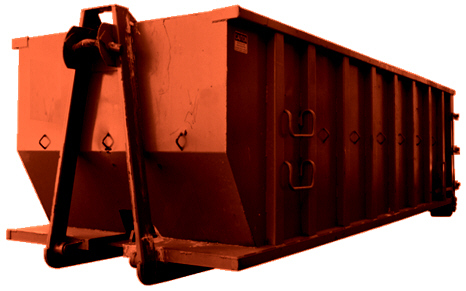 If you have a project where you have to remove and dispose of household junk, trash, waste, construction debris, rubbish or remodeling debris and you need a container or a roll off dumpster, then you should consider renting a dumpster on wheels. We even offer a FREE Loading Service, ask for details. 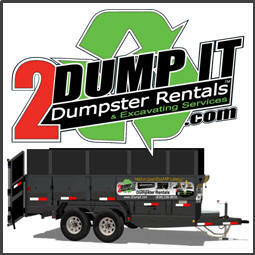 2 DUMP IT™ Rubber Tired Dumpsters (dumpsters on wheels) These containers are like trailers that are pulled behind one ton trucks. They are backed into your desired location; the wheels are secured to keep the container from rolling, and then unhooked from the truck. These containers sit up off the ground and nothing touches your drive other than rubber tires. We chock the tires to keep the container from moving. You do not have to provide wooden planks or plywood to protect your drive. These containers are DRIVEWAY SAFE. *If total disposal weight exceeds the included pounds upon disposal, we charge for the additional overages. *Prices, Sizes and Availability are subject to change without notice. 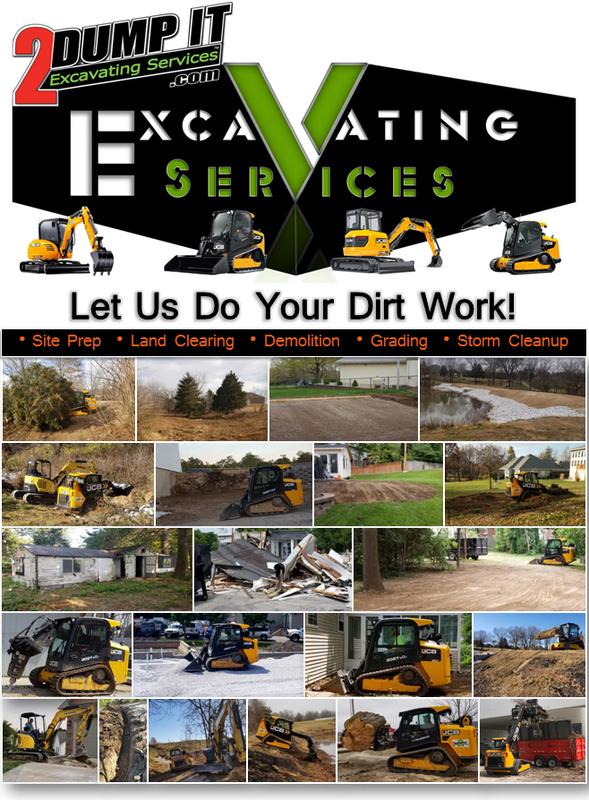 Need a Contractor to Prep your Site, Clear Some Land, Demo Concrete, Demo a Structure, Grading or Trenching? LET US DO YOUR DIRT WORK! 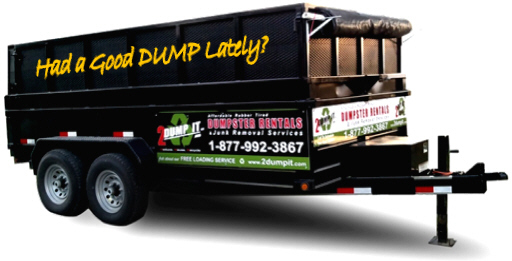 2 DUMP IT™ Excavating Services St Louis MO, provides Site Preparation, Site Clearing, Structural Demolition and Removal, Concrete Demo and Removal, Retaining Wall Demolition and Building. 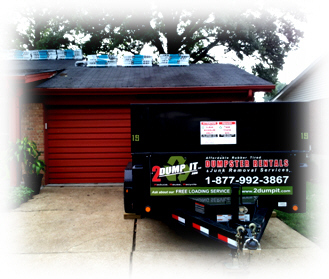 If you are looking for a Contractor in St. Louis with heavy equipment for your construction, remodeling or property improvement project, give 2 DUMP IT™ Excavating Services a call. If you need to rent a skid loader, excavator, track-hoe or a mini excavator for your project then we may be an affordable solution. 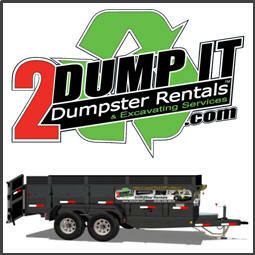 Many times it is much cheaper to hire 2 DUMP IT™ Excavating Services than renting equipment.